5:50–Iowa Governor Kim Reynolds talks with KXEL’s Jeff Stein about the late weeks of the state’s legislative calendar. 6:35–The disastrous effects of African Swine Fever in China have led to unexpectedly large quantities of pork imports to China from the United States. Ag journalist Ken Root analyzes the circumstances which have kept pork flowing across the Pacific, despite a high Chinese tariff. 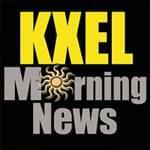 6:50–The KXEL Morning News focuses on faith in northeast Iowa during Holy Week. Courier columnist Karris Golden talks with Tim Harwood about observances of Easter in the Cedar Valley, past and present. 7:35–TV9 Meteorologist Kaj O’Mara says Tuesday will warm into the upper 60s with a chance for rain late. 7:50–The 2019 Cedar Valley Character Counts Champions of Character awards will be presented next Monday. Bruce Clark talks with KXEL’s Jeff Stein about the program.